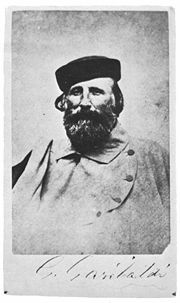 Garibaldi as an Italian soldier. Photograph taken in 1866. Giuseppe Garibaldi (July 4, 1807 – June 2, 1882) was an Italian patriot and soldier of the Risorgimento. He personally led many of the military campaigns that brought about the formation of a unified Italy. He was called the "Hero of the Two Worlds," in tribute to his military expeditions in South America and Europe. The role he played in encouraging Italian nationalism and in unifying the Italian kingdoms and duchies into a single nation state can be compared to that of Otto von Bismarck in Germany. Nationalism was on the rise in Europe. 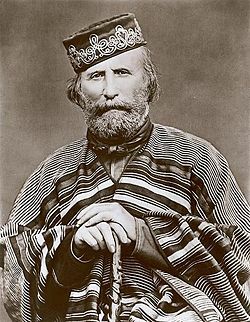 Towards the end of Garibaldi's life, nationalism was rife in the Balkans as Ottoman imperial power declined in that region. Nation states were conceived as linguistically and culturally homogeneous entities, whose people told a common story about their origins and who were usually also united by a dominant religious tradition. Although some Italian city-states had prospered, Italy had not acquired an overseas Empire like other European countries had. Garibaldi left Italy well placed to do so. She finally joined in the scramble for Empire in 1870, when she acquired a foothold in Eritrea, which became an Italian colony in 1890, later also invading and colonizing the area that became Lybia. Garibaldi transformed Italy from a loose confederation of independent states to a modern nation state, one that would emerge as a major economic power in the late twentieth century as a member of the G8 whose members represent 65 percent of the world economy (founded in 1975 as the G6). However, Garibaldi may also have paved the way for the later emergence of Benito Mussolini, the dictator who allied Italy with Adolf Hitler during World War II, since, although united, Italy remained fractious and ripe for a strong leader to exert centralized control. Garibaldi was born in 1807, in the former Italian city of Nizza (called Nice in French and English and Nizza in Italian), taken under French control in 1792. Garibaldi's family was involved in coastal trade, and he was reared to a life on the sea. He was certified in 1832, as a merchant marine captain. A very influential day in Garibaldi's life came during a visit to Taganrog, Russia, in April 1833, where he moored for ten days with the schooner Clorinda and a shipment of oranges. In a seaport inn, he met Giovanni Battista Cuneo from Oneglia, a political immigrant from Italy and member of the secret movement, “Young Italy” (La Giovine Italia). Garibaldi joined the society, and took an oath of dedicating his life to struggle for liberation of his homeland from Austrian dominance. In Geneva, in November 1833, Garibaldi met Giuseppe Mazzini, an impassioned proponent of Italian unification as a liberal republic through political and social reforms. He joined the Young Italy movement and the Carbonari revolutionary association. In February 1834, he participated in a failed Mazzinian insurrection in Piedmont, was sentenced to death in absentia by a Genoese court, and fled to Marseilles. The exile sailed first to Tunisia, eventually finding his way to Brazil, where he encountered Anna Maria Ribeiro da Silva, "Anita," a woman of Portuguese and Indian descent, who became his lover, companion in arms, and wife. With other Italian exiles and republicans, he fought on behalf of the separatists of the Rio Grande do Sul and the Uruguayans who opposed the Argentinean dictator, Juan Manuel de Rosas. Calling on the Italians of Montevideo, Garibaldi formed the Italian Legion in 1843, whose black flag represented Italy in mourning while the volcano at its center symbolized the dormant power in their homeland. It was in Uruguay that the legion first sported the red shirts, obtained from a factory in Montevideo which had intended to export them to the slaughterhouses of Argentina. It was to become the symbol of Garibaldi and his followers. The formation of his force of volunteers, his mastery of the techniques of guerrilla warfare, his opposition to Brazilian and Argentinean imperialism, and his victories in the battles of Cerro and Sant'Antonio in 1846, not only assured the freedom of Uruguay, but made him and his followers heroes in Italy and Europe. The fate of his homeland, however, continued to concern Garibaldi. The election of Giovanni Mastai-Ferretti as Pope Pius IX in 1846, led many to believe he was the liberal pope prophesied by Gioberti, who would provide the leadership for the unification of Italy. From his exile, Mazzini applauded the first reforms of Pio Nono. In 1847, Garibaldi offered the apostolic nuncio at Rio de Janeiro Bedini, the service of his Italian Legion for the liberation of the peninsula. News of the outbreak of revolution in Palermo in January 1848, and revolutionary agitation elsewhere in Italy, encouraged Garibaldi to lead some sixty members of his legion home. After Tunisia, Garibaldi left for Brazil and took up the cause of independence of the Republic of Rio Grande do Sul (the former Brazilian province of São Pedro do Rio Grande do Sul), joining the gaucho rebels known as the farrapos (tatters) against the newly independent Brazilian nation (War of Tatters). During this war, he encountered Anita Ribeiro when the Tatter Army tried to proclaim another Republic in the Brazilian province of Santa Catarina. In October 1839, Anita left her husband, Manuel Duarte Aguiar, to join Garibaldi on his ship, the Rio Pardo. A month later, she fought at her lover's side at the battles of Imbituba and Laguna. In 1841, the couple moved to Montevideo, Uruguay, where Garibaldi worked as a trader and schoolmaster, and married there the following year. They had four children, Menotti (born 1840), Rosita (born 1843), Teresita (born 1845), and Ricciotti (born 1847). Anita was carrying their fifth child when she died (1849). A skilled horsewoman, she is said to have taught Giuseppe about the gaucho culture of southern Brazil and Uruguay. In 1842, Garibaldi took command of the Uruguayan fleet and raised an "Italian Legion" for that country's war (Guerra Grande) with the Argentine dictator, Juan Manuel de Rosas. Between 1842 and 1848, Garibaldi defended Montevideo against Argentinian forces led by former Uruguayan dictator Manuel Oribe. The election of Pope Pius IX in 1846, had caused a sensation among Italian patriots, both at home and in exile. When news of the pope's initial reforms reached Montevideo, Garibaldi wrote the following letter. If these hands, used to fighting, would be acceptable to His Holiness, we most thankfully dedicate them to the service of him who deserves so well of the Church and of the fatherland. Joyful indeed shall we and our companions in whose name we speak be, if we may be allowed to shed our blood in defence of Pio Nono's work of redemption (October 12, 1847). Garibaldi returned to Italy amongst the turmoils of the revolutions of 1848, and offered his services to Charles Albert of Sardinia. The monarch displayed some liberal inclinations, but treated Garibaldi with coolness and distrust. Rebuffed by the Piedmontese, he and his followers crossed into Lombardy where they offered assistance to the provisional government of Milan. Meanwhile, a Roman Republic had been proclaimed in the Papal States, but a French force sent by Louis Napoleon (the future Napoleon III) threatened to topple it. At Mazzini's urging, Garibaldi took up the command of the defence of Rome. His wife, Anita, fought with him. Despite their effort, the city fell on June 30, 1849, and Garibaldi was forced to flee to the north, hunted by Austrian, French, Spanish, and Neapolitan troops. Anita died near Ravenna during the retreat. Garibaldi eventually managed to escape abroad. In 1850, he became a resident of New York, where he met Antonio Meucci. For some time, he worked as a candlemaker on Staten Island. Afterwards he made several voyages to the Pacific, during which he visited Andean revolutionary heroine Manuela Sáenz in Peru. On March 21, 1854, Garibaldi sailed into to the mouth of the River Tyne in north eastern England, as Master of the sailing vessel, Commonwealth. The ship had sailed from Baltimore and was flying the American flag when it docked and unloaded its cargo in South Shields. Garibaldi, already a popular figure on Tyneside, was welcomed enthusiastically by the local working class, although the Newcastle Courant reported that he refused an invitation to dine with dignitaries in nearby Newcastle. As a memento of his stay in the area, an inscribed sword, paid for through public subscriptions, was presented to Garibaldi. His grandson carried the sword to South Africa with him almost half a century later, when he volunteered to fight for the British Army in the Boer War. In total, Garibaldi stayed in Tyneside for over a month, departing at the end of April 1854. Garibaldi returned again to Italy in 1854. In 1859, the Austro-Piedmontese War (also known as the Austro-Sardinian War) broke out in the midst of internal plots at the Sardinian government. Garibaldi was appointed major general, and formed a volunteer unit named the Hunters of the Alps. With his volunteers, he won victories over the Austrians at Varese, Como, and other places. One outcome of the war, though, left Garibaldi very displeased. His home city of Nice was surrendered to the French, in return for crucial military assistance. Garibaldi had won a signal victory. He gained worldwide renown and the adulation of Italians. Faith in his prowess was so strong that doubt, confusion, and dismay seized even the Neapolitan court. Six weeks later, he marched against Messina in the east of the island. By the end of July, only the citadel resisted. Having finished the conquest of Sicily, he crossed the Strait of Messina, under the nose of the Neapolitan fleet, and marched northward. 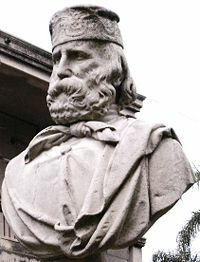 Garibaldi's progress was met with more celebration than resistance, and on September 7, he entered the capital city of Naples. However, he had never defeated the Bourbon king, Francis II. Most of the Sicilian army remained loyal, and had gathered north of the river Volturno. Though by then Garibaldi's volunteers numbered some 25,000, they could not oppose the Sicilians. The volunteers had some success on the October 1, but Francis II retired only the next day, after the arrival of the Sardinian army under the command of Victor Emmanuel. On October 5, Garibaldi set up the International Legion bringing together different national divisions of French, Poles, Swiss, German, and other nationalities, with a view not just of finishing the liberation of Italy, but also of their homelands. With the motto, "Free from the Alps to the Adriatic," the unification movement set its gaze on Rome and Venice. Mazzini was discontented with the perpetuation of monarchical government, and continued to agitate for a republic. Garibaldi, frustrated at inaction by the king, and bristling over perceived snubs, organized a new venture. This time, he intended to take on the Papal States. At the outbreak of the American Civil War (in 1861), Garibaldi volunteered his services to President Abraham Lincoln and was invited to serve as a major general in the Union Army. Garibaldi then reconsidered, saying that he would only serve on two conditions 1) that slavery would definitely be abolished and 2) that he would be given full command of the army. Both these conditions were impossible for Lincoln to accept and so the offer was quietly withdrawn. A challenge against the Pope's temporal domain was viewed with great distrust by Catholics around the world, and the French emperor Napoleon III had guaranteed the independence of Rome from Italy by stationing a French garrison in Rome. Victor Emmanuel was wary of the international repercussions of attacking the Papal States, and discouraged his subjects from participating in revolutionary ventures with such intentions. Nonetheless, Garibaldi believed he had the secret support of his government. In June of 1862, he sailed from Genoa and landed at Palermo, seeking to gather volunteers for the impending campaign under the slogan Roma o Morte ("Rome or Death"). An enthusiastic party quickly joined him, and he turned for Messina, hoping to cross to the mainland there. When he arrived, he had a force of some two thousand, but the garrison proved loyal to the king's instructions and barred his passage. They turned south and set sail from Catania, where Garibaldi declared that he would enter Rome as a victor or perish beneath its walls. He landed at Melito on August 14, and marched at once into the Calabrian mountains. Far from supporting this endeavor, the Italian government was quite disapproving. General Cialdini dispatched a division of the regular army, under Colonel Pallavicino, against the volunteer bands. On August 28, the two forces met in the rugged Aspromonte. One of the regulars fired a chance shot, and several volleys followed, killing a few of the volunteers. The fighting ended quickly, as Garibaldi forbade his men to return fire on fellow subjects of the Kingdom of Italy. Many of the volunteers were taken prisoner, including Garibaldi, who had been wounded by a shot in the foot. Garibaldi took up arms again in 1866, this time with the full support of the Italian government. The Austro-Prussian War had broken out, and Italy had allied with Prussia against Austria-Hungary in the hope of taking Venetia from Austrian rule (Third Italian War of Independence). Garibaldi gathered again his Hunters of the Alps, now some 40,000 strong, and led them into the Trentino. He defeated the Austrians at Bezzecca and made for Trento. When the Franco-Prussian War broke out in July 1870, Italian public opinion heavily favored the Prussians, and many Italians attempted to sign up as volunteers at the Prussian embassy in Florence. After the French garrison was recalled from Rome, the Italian Army captured the Papal States without Garibaldi's assistance. Following the wartime collapse of the Second French Empire at the battle of Sedan, Garibaldi, undaunted by the recent hostility shown to him by the men of Napoleon III, switched his support to the newly-declared French Third Republic. On 7 September , within three days of the revolution of 4 September in Paris, he wrote to the Movimento of Genoa: "Yesterday I said to you: war to the death to Bonaparte. Today I say to you: Rescue the French Republic by every means." Subsequently, Garibaldi went to France and assumed command of the Army of the Vosges, an army of volunteers that was never defeated by the Germans. On his deathbed, Garibaldi asked that his bed be moved to where he could gaze at the emerald and sapphire sea. His wishes for a simple funeral and cremation were not respected. 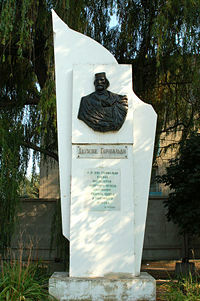 Garibaldi Monument in Taganrog, Russia. Garibaldi's popularity, his skill at rousing the common people, and his military exploits are all credited with making the unification of Italy possible. He also served as a global exemplar of mid-nineteenth century revolutionary nationalism and liberalism. But following the liberation of southern Italy from the Neapolitan monarchy, Garibaldi chose to sacrifice his liberal republican principles for the sake of unification. Statues of his likeness, as well as the handshake of Teano, stand in many Italian squares, and in other countries around the world. On the top of the Gianicolo hill in Rome, there is a statue of Garibaldi on horse-back with his face turned in the direction of the Vatican, an allusion to his ambition to conquer the Papal States. ↑ A. Werner, Autobiography of Giuseppe Garibaldi, (New York: Howard Fertig, 1971). ↑ Guiseppe Garibaldi, Autobiography (1889). ↑ Guiseppe Garibaldi and Alexandre Dumas, The Memoirs of Garibaldi (1861). Morris, Charles. 1902. Young People's History of the World for the Past One Hundred Years. Ridley, Jasper. 1976. Garibaldi. New York: Viking Press, 1976. This page was last modified on 23 June 2017, at 15:55.